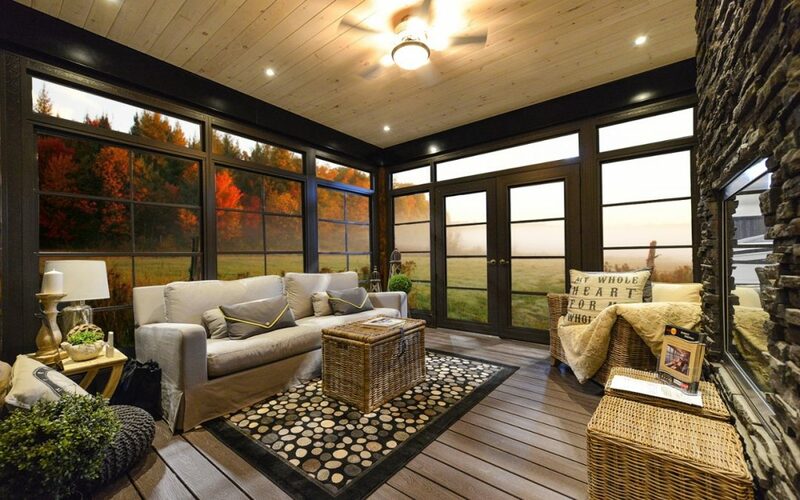 Glass or Vinyl For Your Screened In Porch Windows? This is a question that has probably crossed your mind at least once during your porch build or remodel project. Well, you are in luck! We have some insights that might help make the decision a little easier. Sunspace’s WeatherMaster Porch Windows are built with light-weight View Flex Vinyl Glazing offering you a luxury look that is made to withstand all seasons. Additionally, each and every window is custom made to easily fit your existing porch layout, saving you from making costly modifications to the structure. Continue reading to learn more about how vinyl porch windows, in our opinion, are superior to glass. Vinyl windows preserve the “porch” feel. One reason people love a Sunspace 3-season porch is because it gives them the luxury of experiencing the outdoors without necessarily having to be outdoors. Vinyl offers just that. And because the panels are easy to remove, with just a few steps you can take them down for the summer and enjoy the outdoors with just a screened in porch. Glass windows unfortunately don’t provide that option and make your outdoor space look and feel like just another room in your house. Vinyl porch windows keep out the elements while maintaining the open feeling of an outdoor space. They last longer as the seasons change. Sunspace’s unique WeatherMaster window system allows you to keep the unique, inviting feeling of a screened-in porch regardless of the season. Our product is designed to keep the elements out while providing 75% ventilation. Much more than your standard windows. Also, our vinyl windows are flexible, as seen in video below, which makes them much more shatter resistant than any other product out there. Wanna see just how durable WeatherMaster vinyl windows are? Less maintenance required! WeatherMaster porch windows are made with sturdy aluminum frames that don’t require any painting or staining. The durable View Flex Vinyl has UV inhibitor built right into it so it keeps its transparency and durability. We guarantee it! Just clean the panels every 6 months, and we provide a LIFETIME GUARANTEE on the vinyl. Glass windows are made for inside the house and not for an unconditioned outdoor space. WeatherMaster Porch Windows are low maintenance and designed specifically for use in a porch or sunroom and will stand up to the harsh Minnesota climate. We can get a style that best fit your tastes. To meet the desires of so many customers, our windows are custom made and are available in seven distinct colors with numerous screen and tinting options. We have windows that slide up and down vertically or left to right horizontally as well as many door options to match. However your porch is layed out, we can design a system that looks great and is functional to reclaim your outdoor spaces. Most importantly, Sunspace’s WeatherMaster Porch Windows are guaranteed to last you a lifetime, providing you with a worry-free product forever! Interested in enhancing your next home project experience? Contact a Sunspace of Philly at (610) 585-4575 and let’s get started.